I have felt a little under the weather this week, so for lunch I really needed some comfort food. I have eaten way too much junk food lately and felt my body needed a hearty bowl of soup. I opened my freezer door and browsed through my frozen vegetables. I started with a chicken breast, carrots, bay leaf, salt, pepper and water in a stock pot. What’s more comforting than Chicken soup? A chicken soup containing one’s favorite comfort foods. I love okra and tomatoes, so I added those to the pot. I sprinkled in a few of my favorite seasonings, like thyme, basil, and Tony Chachere’s seasoning. I adore cornbread dressing, so when I ran across a trinity mix of chopped celery, bell pepper and onions in the freezer, I knew I had to add them to the pot. I also sprinkled in a little sage. While those were coming to a boil on the stove. I whipped up some corn bread Johnny cakes to cook on the griddle to go with my soup. Homemade Macaroni and Cheese and corn on the cob are a few more of my favorite foods. Once the soup came to a boil, I threw in the elbow macaroni and corn and continued to boil for ten minutes to cook the macaroni. I continued to season the soup to taste, adding more salt and water if needed. 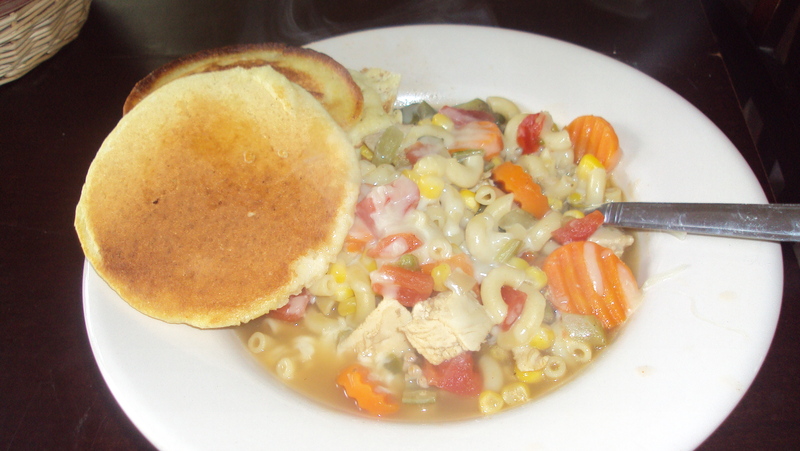 Once the macaroni was al dente, I ladled the soup into my favorite bowl, topped it with grated cheese, and grabbed a few Johnny cakes on the side of my bowl. All I can say is “Wow!” why didn’t I come up with this sooner? I hope this encourages you to try your own Comfort In A Bowl recipe. Feel free to share some in the comments.